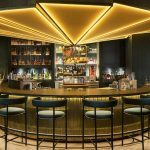 Mandarin Oriental, Munich has opened Ory, a chic new cocktail bar serving avant-garde drinks in a contemporary setting. Conceptualised by gastronome Maximilian Gradl, Ory is operated by his company Barschaft B17 GmbH, which includes Munich’s award-winning Herzog Restaurant & Bar in its portfolio of venues. Ory has been designed by acclaimed architect Özgür Keles and his studio, Selektiv. Within Ory’s eye-catching dark green and gold interiors, featuring brass fixtures, wood panels, red velvet seating and large potted-plants, guests will find a welcoming yet sophisticated atmosphere. Gelato containers at the bar and a filtered water fountain in the centre of the room are among Ory’s distinctive features that break the mould of traditional cocktail bar design. Ory’s unconventional drinks menu is divided into four categories: Ory Classics features newly interpreted versions of famous cocktails, using different textures, such as coconut sorbet instead of cream or syrup. Ory Signature Drinks includes playful creations like the Royal Hawaiian, a traditional tiki cocktail of gin, almond, lemon and pineapple, refined with a roasted almond and Tonka orgeat and topped off with champagne. 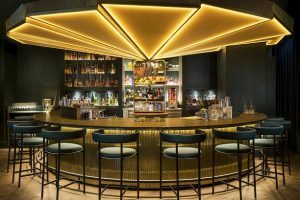 Ory Apero is a creative and light-hearted aperitif menu and Ory Highballs completes the quartet with refreshing versions of Gin and Tonic and other old-style favourites. Supplementing the cocktails are a sophisticated and seasonally changing wine collection and selection of champagnes, including Krug by the glass poured from a magnum bottle. Imaginative bar food dishes inspired by international comfort food, like Ribs Don’t Lie, pork ribs refined with plum, cilantro and lime, or The Coconut Knight, French toast with coconut milk and pineapple-rum marmalade, feature on Ory’s dining menu. Ory opens daily. Reservations can be made for parties of up to four people by phone +49 89 58 80 54 57 or email to info@ory.bar.